You can find an updated version of our selection of Nexus 6P cases right here. So, have you ordered your Google Nexus 6P already? Or maybe you've chosen the smaller Nexus 5X? Either way, you'll soon be enjoying the best Google experience to date on a respectable and capable smartphone. While you're waiting for your parcel to arrive, you might want to explore the list of cases for the new Nexus phones. We've already put together one listing the best Nexus 5X cases so far, and below we have the Nexus 6P cases worth taking a look at. The lists aren't long, that's for sure. After all, the smartphones have just been announced, and the Nexus lineup has never really been of top priority to accessory makers. That said, we give you the best Nexus 6P cases we could dig up. Better cases for the Nexus 6P are surely coming at a later time, but for the time being, here are all the offerings we can recommend. It is hard to go wrong with a smartphone case designed by the device's maker itself. That's why the official Nexus 6P protective case is one you should check out. The material chosen for the accessory's back is a woven fabric, with a futuristic, polygonal pattern etched into it. Colors for the case have been chosen to complement the handset, regardless of the color you have chosen. Right after the Nexus 6P's announcement, Speck announced a version of its signature CandyShell Grip case designed for Google's handset. It is tough and grippy, which makes it a very practical accessory. It would have been nice if it came in a broader palette of colors, however. 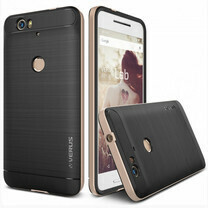 This protective case by Verus aims to strike a balance between protection and comfort. It isn't overly thick, yet it should protect your Nexus 6P against accidental bumps and drops. It is comprised of a TPU layer reinforced by a polycarbonate frame. Brace yourselves as we're about to enter into Amazon territory, where low-cost Nexus cases have popped up already. This inexpensive specimen is comprised of a hard shell with soft, rubbery corners to absorb shock. It come in black, blue, green, pink, and purple. And to wrap things up, we give you this translucent protective case. Its surface should prove durable enough to reflect light impacts, but we don't have high hopes for its durability given the price. Google could have atleast put a window on the front of the flip cover. PhoneArena transformed from iPA to GoogleArena 0 to 100. Can you blame them. That 6P kills the iPhone 6S Plus at a difference of $250 and that's for a 16GB iPhone. Apple should be ashamed right now releasing a 16GB $600 plus phone in 2015.
we will see if it kills the iPhone 5s never mind the 6s. Much better release than the nexus 6. That Verus case really makes the back of the 6P even better looking. The standard Google case looks nice but not the folio one. Lmao nice PSA. Also thanks for the link! that case blocks the laser autofocus http://www.androidpolice.com/2015/09/30/psa-many-third-party-nexus-6p-cases-appear-to-block-the-laser-autofocus/ i'd probably save my $2. I like how slim the Red Shield one is. Nice looking. pls go back to talking about the iPhone 6s, 6s+.. nothing to see outta googles corner except marshmallow. I want a wallet case like the PDair card wallet Leather case. Unfortunately when you look at the products pdair,there is only red stitch version. I like black with black. anyone know whether PDair accepts customization? How long will it take to arrive?